Holy Family Parish continues its Backpack for Kids program when classes are out, donating food children in need who attend Woodmere Elementary School’s summer school program. Approximately 90 percent of the students enrolled at the southeast Portland school qualify for free and reduced lunch. Parishioners are invited to take empty backpacks home with them from Mass (the backpacks are provided by the parish and reused as long as they're functional), along with a shopping list. 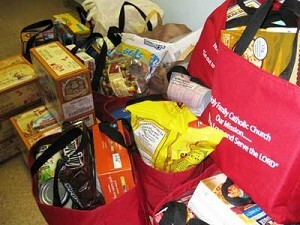 Parishioners then return the food-filled backpacks to the Parish center on Wednesdays, when the Holy Family Leadership Team delivers the food to Woodmere for distribution. Holy Family has teamed up with Moreland Presbyterian and the Rotary Club of Southeast Portland, taking turns delivering backpacks to Woodmere. "This is an awesome ministry to have had the opportunity to reach to and serve children in Holy Family's own backyard,” said Vicki Ford, religious education director.